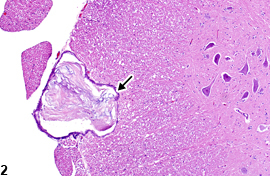 Brain, cingulate cortex-incidental epidermoid cyst (arrowhead) in a male B6C3F1 mouse from a chronic study. 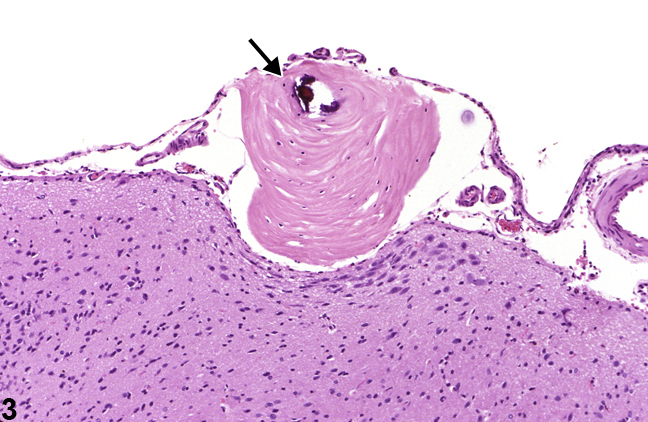 Lumbar spinal cord�incidental epidermoid cyst (arrow) in a male Sprague-Dawley rat from a chronic T-62 study. 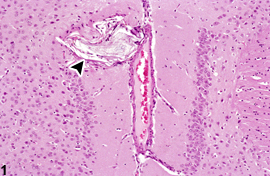 Cortex, sub-leptomeningeal-incidental epidermoid cyst (arrow) in a male F344/N rat from a chronic study. Brain, hippocampus-incidental epidermoid cyst (arrow) in a male F344/N rat from a chronic study. Spinal radicle-incidental epidermoid cyst in a female F344 rat. Epidermoid cysts are benign hamartomatous structures, which, from their location and size, may interfere with normal neural functions but are usually clinically silent since the slow increase in size allows for adaptation and compensation by the nervous system to the presence of the space-occupying mass. In Figure 1 , the poorly developed epidermoid cyst is located in the cingulate cortical gyrus at the dorsal frontoparietal midline location. 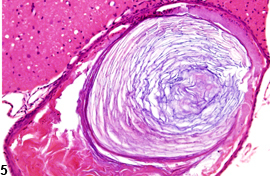 Such epidermoid cysts are considered to arise from embryonic rests of epidermal tissue that remain closely associated with the infolding neural tube when it separates from the overlying neural plate. 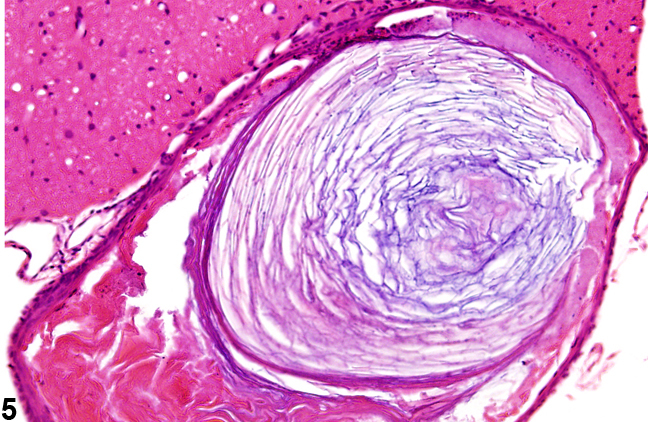 The cyst, as it forms, compresses the cortex and has a thin epidermal, often stratified squamous epithelial lining and modest amount of keratin debris at the core. Note the bilateral induseum griseum, a compact normal region of neuronal cells, which is part of the limbic system associated with hippocampal relays. Figure 2 depicts a more advanced development of a sub-leptomeningeal epidermoid cyst located in the lumbar ventral spinal funiculus. Adjacent laterally are spinal nerve roots, and adjacent internally is the ventral spinal gray matter column. The extensive compression of the funicular tissue is apparent, but no clinical signs were detected in the animal. Figure 3 shows the location of an incidental cortical sub-leptomeningeal epidermoid cyst underlaid by the pia mater. 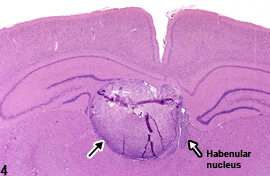 There is compression of the underlying cortex and loss of neurons in the adjacent nucleus. 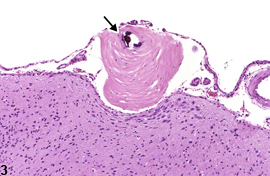 Dystrophic mineralization of the central portion of the keratin core is present. In Figure 4 , this large incidental epidermoid cyst has a midline location above the diencephalon and compresses the adjacent hippocampal dentate gyrus and habenular nuclear structures. Note that the cyst is cellular and relatively poorly keratinized. 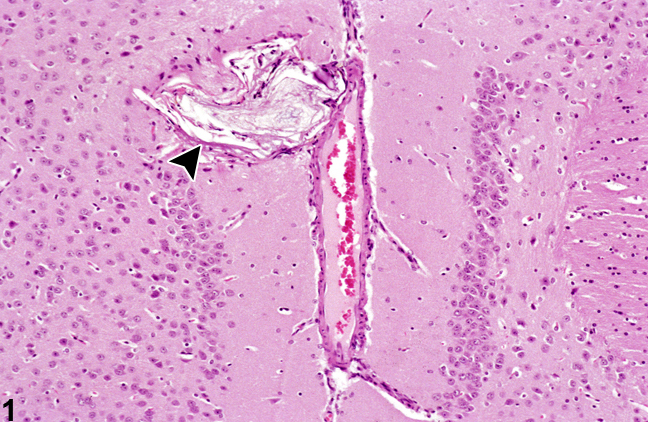 In Figure 5 , the epidermoid cyst confines itself to a spinal radicle (nerve root), where its progressive enlargement has totally effaced the nerve fibers, leaving only the epineurium and perineurium intact. Although epidermoid cysts are generally considered background lesions, they should be diagnosed in NTP studies along with the subsite. Epidermoid cysts do not need to be graded. Iaconetta G, Carvalho GA, Vorkapic P, Samii M. 2001. Intracerebral epidermoid tumor: A case report and review of the literature. Surg Neurol 55:218-222. Krinke GJ, Kaufmann W, Mahrous AT, Schaetti P. 2000. 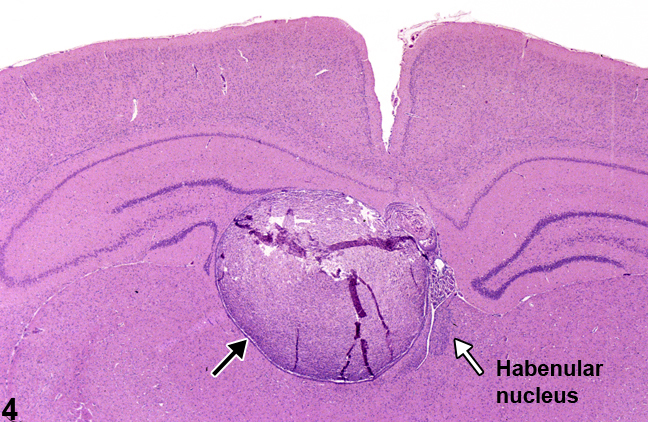 Morphologic characterization of spontaneous nervous system tumors in mice and rats. Toxicol Pathol 28:178-192.